Menopause usually occurs in women over 40, although its onset can differ from one case to another. No matter how healthy, women are prone to experience the side effects of the hormonal imbalance caused by menopause such as hot flashes, insomnia, decreased libido, mood swings, and irritability. Hormonal replacement therapy can be used, but it is not always recommended, because of the side effects it can be accompanied by. Natural remedies are much recommended, and Golden Natural Formula Menopause is a combination of herbs traditionally used in the treatment of menopause. 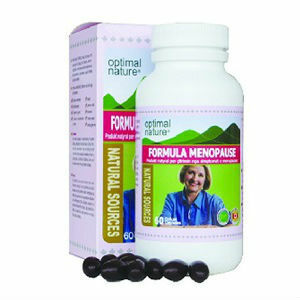 Let’s see what this formula is made of and how it can help in relieving side effects of menopause. What Does Golden Natural Formula Menopause Contain? We notice a lot of herbal remedies used in the formula. Black cohosh, for instance, have been used traditionally for many years in the treatment of hot flashes, a known side effect of menopause. The same effect is provided by soybean isoflavones, and using them in one’s regular diet, can lead to the lowering of cholesterol. Wild yam is used as natural treatment for balancing hormones in women, and it helps maintaining a healthy libido; it also combats vaginal dryness. While this looks like a good natural formula, it must be mentioned that more powerful, recently discovered remedies like Protykin® and ammonium succinate are not included. The recommended dosage for Golden Natural Formula Menopause is one softgel daily. This product is sold in 60 capsule bottles, but no information on the pricing is offered on the manufacturer’s website. We did not see any information regarding guarantee policies listed on the official website. As a natural remedy, Golden Natural Formula Menopause looks to be a good recipe for addressing some of the symptoms experienced by women going through menopause, such as hot flashes and vaginal dryness. However, women can be affected by more side effects, and taking more formulas may be required in this case for their well being. Jackie Horowitz	reviewed Golden Natural Formula Menopause	on September 20th	 and gave it a rating of 2.5.